Sometimes irritable, bored kids are inevitable in my house. (Okay, more than sometimes.) And since I’m quite possibly the worst crafter on the face of the planet, my poor children can go a little crazy over weekends. After games and books and quick trips to the store are all exhausted, I desperately need something to distract my three girls from their non-stop arguing and fighting. Baking to the rescue. My 3 and 5-year old daughters love to help out in the kitchen. And their older sister loves to eat baked goods. So we set to whipping up a batch of carrot applesauce muffins. 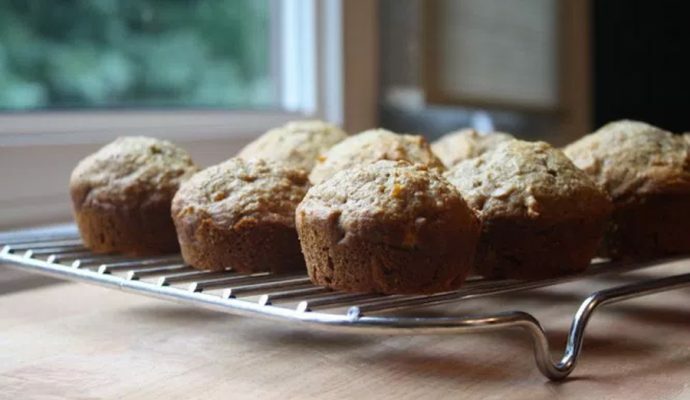 This recipe is inspired by the carrot applesauce muffins from 100 Days of Real Food. I absolutely love that site. And the recipes rarely need any changing. But I made a small tweak here and there to make these muffins more me. In a medium-sized bowl, mix together the flour, baking soda, cinnamon and salt. (And hemp seeds if you choose to add them. They can change the texture a teensy bit. So you may want to try them both ways and decide which way you like the muffins best). In a large bowl, mix together the butter, honey, egg and vanilla. 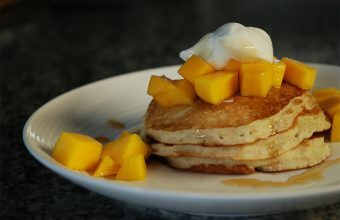 I use an electric hand mixer to thoroughly mix these ingredients together. Add the flour mixture and continue to mix until it’s all combined. Bake for 18-22 minutes, depending on your oven. Until the muffins start looking golden brown. There you have it. Another healthy snack my kids will gobble up (and I can freeze ahead and pop into school lunches soon)! Perfection.